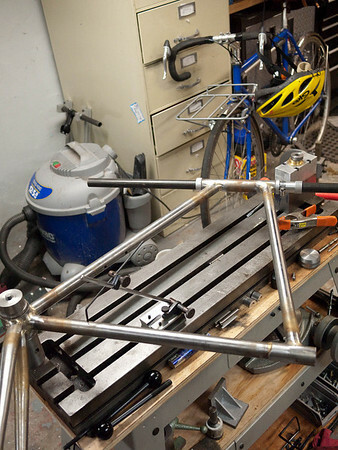 The next step in building my frame is attaching the seatstays. Before doing that I needed to make sure that the chainstays were properly aligned. It will be much more difficult to correct axle alignment issues once my seatstays are attached to the frame. The frame is connected to the table at the bottom bracket. The bottom bracket post is machined to be exactly perpendicular to the table, and the table is a flat reference surface. If the frame is aligned then it should all lie in a plane exactly parallel to the alignment table. The pointy thing coming down from the top is a scratch gauge. I set it’s height so it just barely touches the sleeve. When you draw it across the sleeve you can just hear it make a scratching noise. 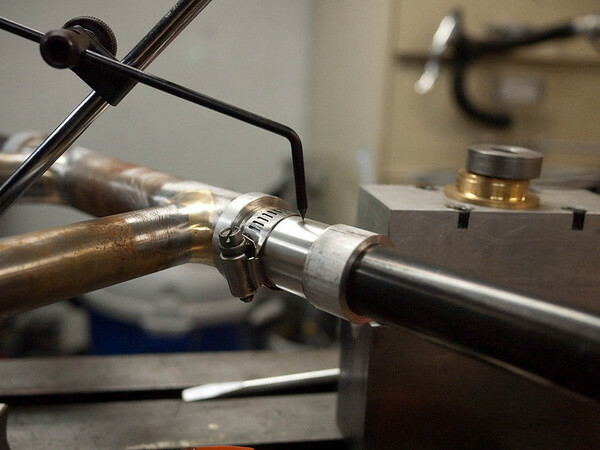 It is important to check both sides of the steerer to make sure that it isn’t twisted with respect to the seat tube. At this point in the build it would be very difficult to correct that, but when the frame was just tacked (before final brazing) it was easier. 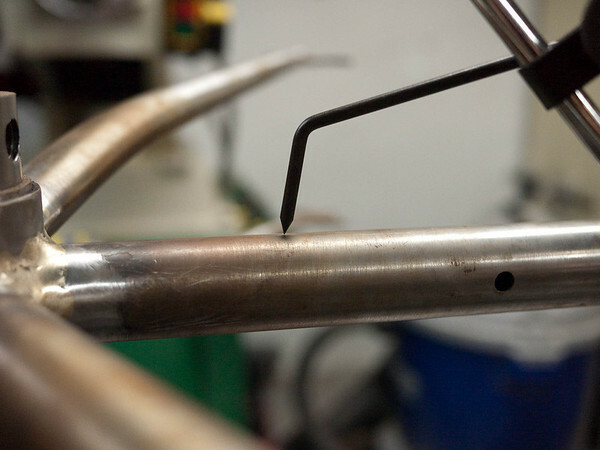 Now that we’ve double checked the front triangle alignment it is time to take a look at the chainstays. First I check to make sure that they are centered with respects to the seat tube. To do that I use this alignment gauge that I had made (I copied the design from Martin Tweedy) and a height gauge to hold it. 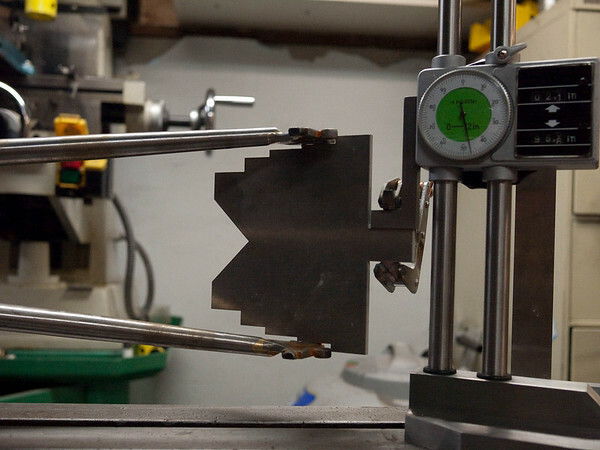 In this photo I’m aligning the height gauge with the seat tube. 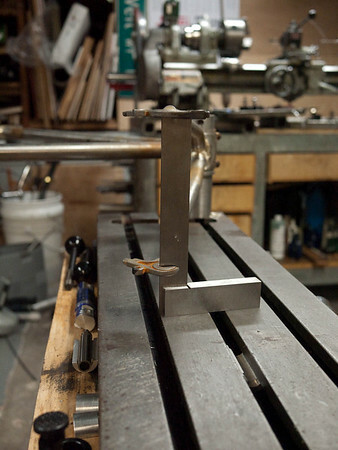 Notice that the frame has been rotated on the alignment table to put the chainstays over the table. It just takes a little push to eliminate that gap. 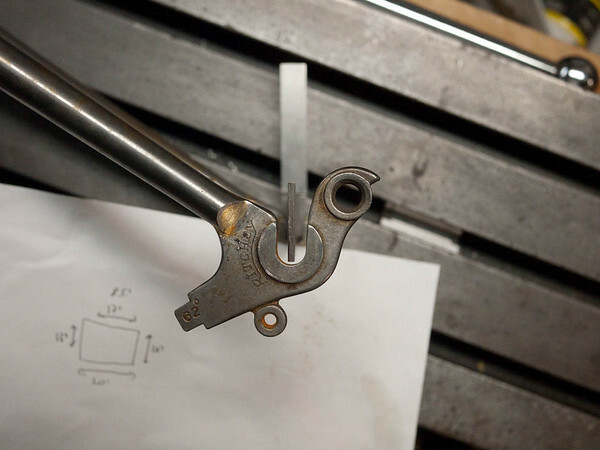 On a final alignment I’d also use the Park dropout alignment tools to make the dropouts square with each other. I don’t need to do that at this point though. The whole process is iterative. After every change I need to go and double check anything connected to what was changed. In the process of cold setting the rear dropout spacing I could easily bend the chainstay up so that the dropout is a millimeter or two out. This is obviously only showing a little bit of the alignment process, but it covers the basics of how I use the alignment table. You can also see why a larger table would be nice. I have to rotate my frame many times to compare everything. 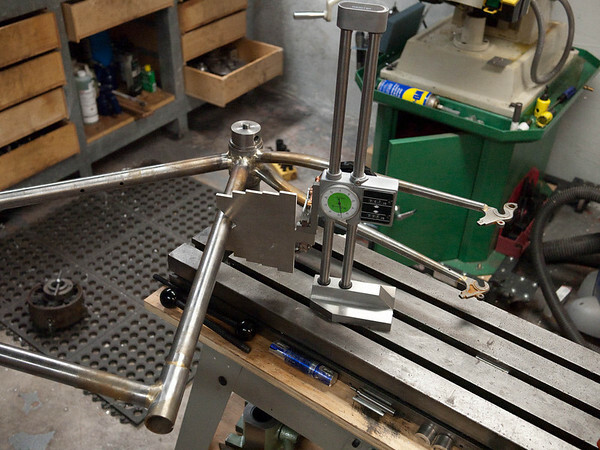 A 2×3′ table allows you to check the whole front triangle or the whole rear triangle without rotating the frame. 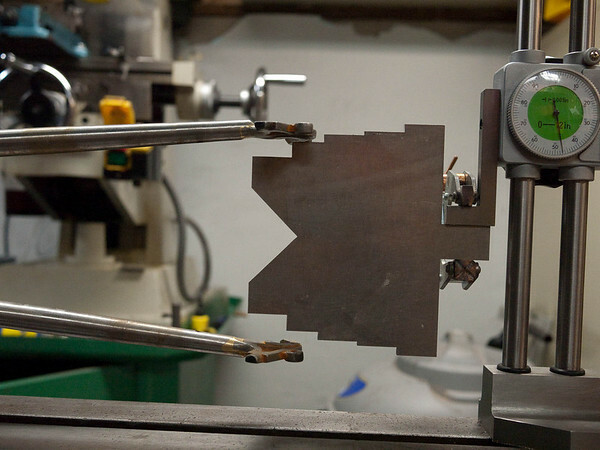 A 3×4′ table is enough to check alignment of the whole frame without rotating it. My table is 8″ wide by 32″ long. not much to say but cool. looking forward to future editions of this series. thanks! This whole series just adds to my respect for frame builders. I”m imagining how having the dropouts misaligned just a fraction results in the wheel being off-center by a much larger amount, and in ways that even horizontal dropouts wouldn”t help with. Thoroughly impressed, what fantasic facilities.